I can't believe it, but I've actually played along with the Splitcoast Challenges all week! This is the Way to Use It...something old, something new....the image is a very old one but new to me from Sparkle N Sprinkle (if you want this image just leave me a comment and I will get it for you) ...I decided to color it last night, then received an email about an old friend that is having heart trouble, so I thought it appropriate to send and it went along with the challenge. The ribbon is old, the button and background cardstock is new. 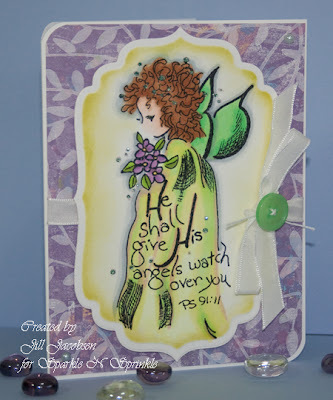 I also used my Spellbinders Grand Dies and Grand Calibur....love that machine! This is a beautiful card. I would love to have this image, is it still available at SNS?? What a sweet, SWEET card, Jill! Marvelous coloring! So pretty- your cards always make me smile!